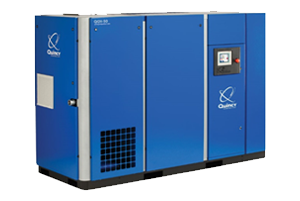 Variable speed oil-flooded rotary screw industrial air compressors are designed to offer the same reliable service as fixed speed compressor, but using the least possible energy to meet the fluctuating air demand. With perfect, instantaneous response to your industrial air demand, you can enjoy stable plant pressure that automatically adjusts to your current plant air compression needs. The compressor comprises two screws (male and female rotor), a housing or stator, and bearings and bearing supports. To achieve speed variation, the male rotor is driven through a series of gears in the drive housing (not directly by the motor). The male rotor (with four lobes) drives the female (with six lobes). Steady or plise-free compressed air is released via a vent in the end plate at about 85 degrees Celsius, and delivered to a receiver or a secondary compressor for two-stage compression. The positive displacement compressor assembly is flood-lubricated and uses one or two stages to deliver the desired, fluctuating pressure, through a continuous compression process. Packaged units are usually self-contained and mounted on a skid base, and configured to supply plant (not process) air at maximum pressure of 10 bar. The compressor is typically powered by an electric motor and enclosed in a sound-attenuating housing with removable panels for easy serviceability. The compressors can be used for a wide range of industrial applications that require air volumes of 6 to 50 cubic meters per hour, at pressures of 7 to 10 bar, and capacity of 15 to 350kW. Oil-filled variable speed rotary screw air compressors are designed in compact units featuring a quiet enclosure to minimize vibration and noise levels, while allowing easy serviceability. Whether you use your air compressor for small workshop operations or bigger applications in a large plant, it is important to partner with a reliable service and maintenance company in Ventura & Los Angeles to ensure that you have ready access to genuine spare parts and a skilled team of engineers and technicians for routine maintenance or in the event of a breakdown to minimize downtime. This entry was posted in Industrial Air Compressors and tagged industrial air compressor equipment, industrial air compressor systems, variable speed rotary screw. Bookmark the permalink.